I had a rather good time watching this. It is the kind of low budget movie you know will get made over and over. Simple idea. Simple execution. Simple to follow. And easy to enjoy. In fact there's not even a need for real name actors of any kind... If you are an independent filmmaker and your uncle has a bag full of money, make this movie. It will work. Guaranteed. I found the script to be well crafted. It didn't ask much from the audience. The problem upon which the horror theme is built is quite simple. 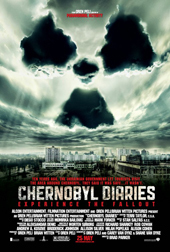 It revolves around a nuclear disaster with enough notoriety to gain instant credibility. What of the small towns that surround the Chernobyl nuclear meltdown? Specially when we have in current news the nuclear disaster in Japan? Perhaps we should repeat this formula in its Japanese version? I'm in! The scares come mostly from what we don't see. A job well done by the filmmakers. They keep us wondering what the hell is out there? And they actually hold out long enough to show us and stay interested. Also, the Russian guide does a great job hinting at the fact that he knows more than he is telling these kids. And the kids themselves make good use of their roles. Believable all the way through. I don't want to give away the surprises. But if there was a small shortcoming, and I do insists on short, it was their practical effects budget. You'll see what I mean. I would have rewritten the ending slightly different. A couple of choices didn't need to overdo it, but it is believable where it is. I liked it, and I'm sure you won't be disappointed when you watch it.